I am pretty tired tonight. Before we left this morning, we weighed our packs. I was really hoping for under 40lbs. The moment of truth came…52lbs! I was in shock…and then I realized Stumbling Goat was playing a prank on me and was pulling on the scale. Whew! My pack ended up weighing 41lbs and I was not happy about that. 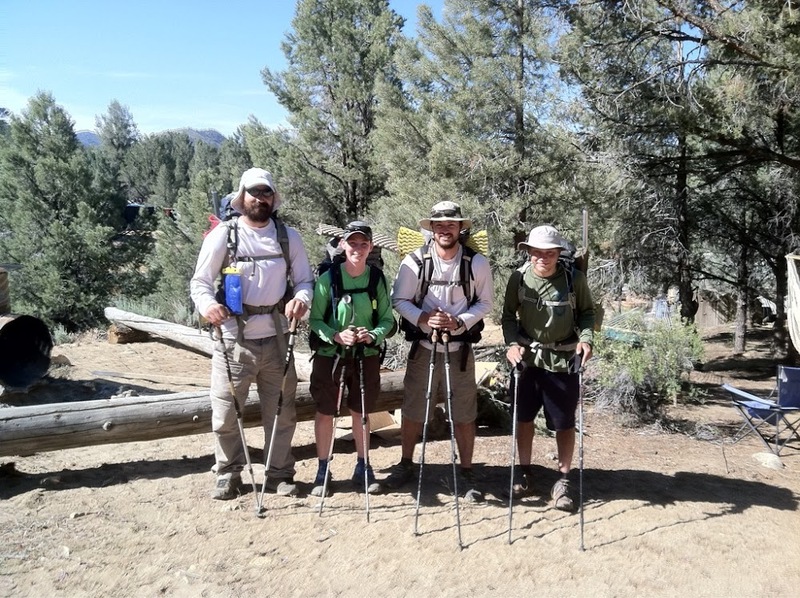 The general rule is to have your pack no more than 30% of your body weight and mine is 35%. I might have packed too much food, but I’d rather be safe than sorry. I keep telling myself it will get lighter each day. I left out with Top Shelf (46lbs), Pine(40lbs), and Blister(39lbs). We were later joined by Speedbump and we are all camped together now. The first hour, the weight felt okay. Then the next three hours hurt my shoulders and waist and I contemplated how easy it would be to just give some of the food to day hikers I saw today. It took a lot of self control not to do that! After four hours, the weight finally felt painless and I had adjusted. 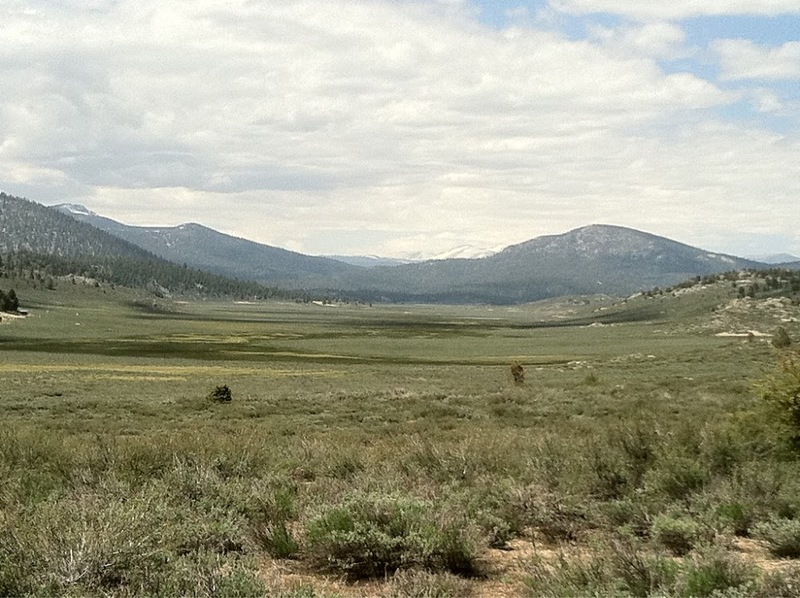 I think it helped that I was in a beautiful meadow and I got an exciting view of the Sierras in the distance. The picture doesn’t do it justice. We are currently camped way up on that hill on the right. I was surprisingly enjoying the hike today and hiked alone the whole day. I knew I’d be slower than the guys and told them I’d just meet them at the end of the day. Most of the day was a gradual uphill and the last 4mi got steep. That is when the pain set in and I couldn’t wait to get my pack off. A few miles before camp, I turned a corner and it was quite a sight. 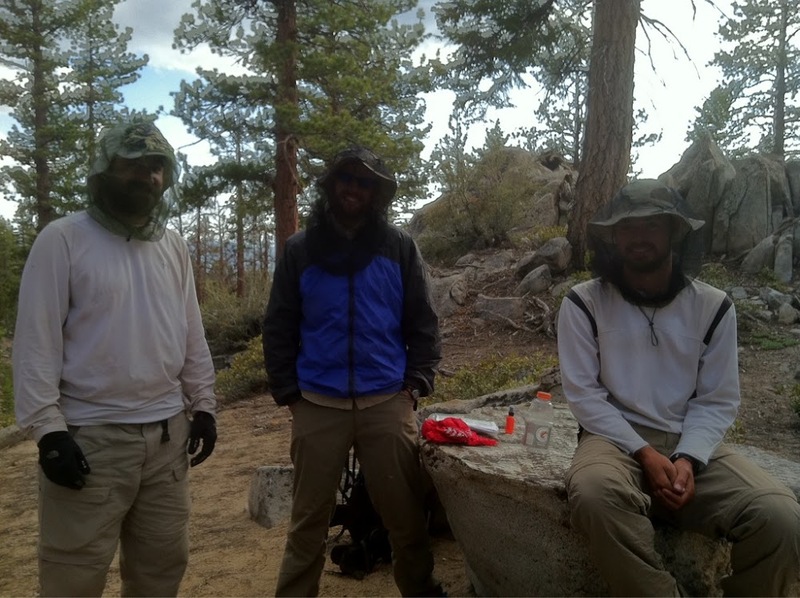 The guys had gathered for a break and they all had their mosquito nets on. The end of the day today was the first time all trip that I’ve needed to use my bug spray.